UPDATED- See more recent blogpost regarding new features to assist agencies using Call Tracking Metrics. We are excited to be assisting you and your clients with tracking phone calls. Our product is continuing to evolve to best meet your needs and we welcome your feedback on features that would be helpful to add. In the meantime, we have put together a list of best practices to help you get started. 1) Put Your First Account in Your First Client’s Name: Use your client’s website information, business phone number information etc. Your email address and contact information should be used as you will be the administrator of the account. The billing can be done on your agency credit card or directly on the client’s card- thats up to you. It’s important to keep each client separate for reporting purposes. 2) Add additional clients by adding accounts: You can do this easily by going to the “Add Account” page on the settings menu. You will set up each account as you did the first account (see above). 3) Keep track of your accounts on the “Manage Accounts” page (within the settings menu). This page allows you to switch back and forth between accounts, edit accounts etc. You will always know which account you are in by looking at the top right of the page. It will be right under the “sign out” button. 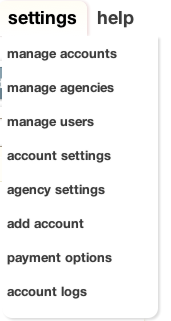 4) Add users to each account: You can add other people in your agency and your clients to the accounts by going to the “Manage Users” page within the settings menu for an account. You can add users as report viewers, report managers, or admin. By having the accounts separate, you can be sure that by adding a client to one account, they will not be able to view another client’s account. 5) Whitelabel your reports: This is done on the “Account Settings” page within the settings menu. Whitelabels allow you to customize your Call Tracking Metrics reports to reflect your own brand image. We also provide a custom login page with your logo. Do I need to set up a master account for my agency? No, there are no master and sub-accounts in our system. Your agency will not actually have its own account but rather each client will have an account so that the reporting is siloed. As the agency, you will be the administrator for the accounts and be able to view and edit all aspects of the accounts. You will also be able to view all accounts that you administer on your “Manage Accounts” page. Can I charge the customer directly for Call Tracking Metrics? Yes, in the “Payment Options”, enter in your client’s credit card (or have them enter the card) for billing for their account. Can I whitelabel the whole experience with Call Tracking Metrics (url’s etc)? Currently, you can whitelabel the report pages. We are in the process of rolling out the ability for agencies to have even further abilities to customize. Is there a master agency report? Not yet, but we are close to rolling this out!